Recognizes a 47-55 kDa-tumor suppressor protein, identified as Wilm’s Tumor (WT1) protein. K562 cells. Wilm s Tumor, mesothelioma or fetal kidney. Recognizes a 47-55 kDa-tumor suppressor protein, identified as Wilm’s Tumor (WT1) protein. The antibody reacts with all isoforms of the full-length WT1 and also identifies WT1 lacking exon 2-encoded amino acids, frequently found in subsets of sporadic Wilm s tumors.WT1, a sporadic and familial pediatric kidney tumor, is genetically heterogeneous. Wilm s tumor is associated with mutations of WT1, a zinc-finger transcription factor that is essential for the development of the metanephric kidney and the urogenital system. 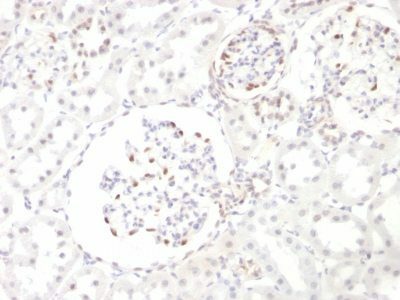 The WT1 gene is normally expressed in fetal kidney and mesothelium, and its expression has been suggested as a marker for Wilm s tumor and mesothelioma. WT1 protein has been identified in proliferative mesothelial cells, malignant mesothelioma, ovarian carcinoma, gonadoblastoma, nephroblastoma, and desmoplastic small round cell tumor. 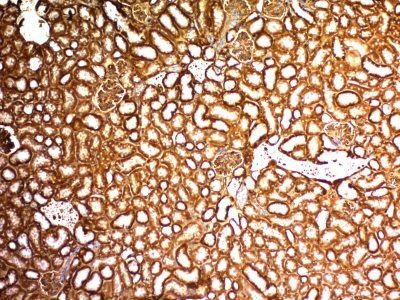 Lung adenocarcinomas rarely stain positive with this antibody. 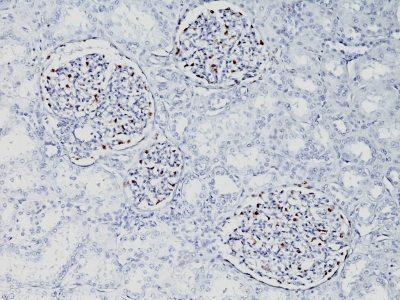 WT1 protein expression in mesothelial cells has become a reliable marker for the diagnosis of mesotheliomas. Catalog number key for antibody number 0857, Anti-Wilm's Tumor 1 (WT1/857) The prefix indicates conjugation, followed by the antibody number and size suffix.